This blog describes features that are either new or changed in the November 2017 release of Data Integration for Common Data Service (CDS). First, a huge thanks to all our customers who have been successfully using the Data Integrator to get data into the Common Data Service. Back in July 2017, we announced the public availability of the Dynamics 365 Data Integration feature that enables the flow of data between Dynamics 365 for Finance and Operations, Enterprise edition, and other products through the Common Data Service. As you are already aware, we are in a continuous update cycle and regularly update our platform. Admin dashboard for monitoring: A dashboard that shows all the recent project runs with execution status and a drill-down to see all executions. Support for additional regions: Data Integrator is now supported in Australia and Canada. New templates: Synchronize accounts directly from Dynamics 365 for Sales to customers in Dynamics 365 for Finance and Operations, Enterprise edition. Email-based alert notifications – Ability to configure email- based alerts. Ability to re-run an execution – A top customer ask is the ability to rerun fail syncs. Before I walk you through the feature details, I’d like to explain the scenario we are trying to solve. A quick summary of what jobs are running. What is the current state. Do any of the projects require remediation. We also understand that customers need to be on the move and so they need a round-the-clock monitoring system that can alert them to warnings or failures. As we all know, errors can manifest due to issues in source or target data. Administrators have asked us for an intuitive way to point them to the source of the error so that they can mitigate the issue and expect the integrator to automatically pick this up in subsequent runs or give them the ability to optionally re-execute the job. The goal of the dashboard is to provide a one stop real-time view of all your project runs and their status with a drill-down to view details of executions. The dashboard shows you the total count of runs by state and a count of runs by execution state over time. These are color-coded to show status of each project – green for completed projects, yellow for completed projects with warnings, and red for failures. While the default shows you the executions over the last two weeks, you can easily customize the reports by toggling the report timeframe drop-down menus. The bar chart also provides a quick look-up of project execution date, status, and count of records that were updated. You can further customize the view by right-clicking the bar chart and showing data in a split view. Additionally, you can use Visual filters to further customize the records that you want to see. We have also provided the ability to investigate a failed project execution by providing a drill-down to the specific record that failed to synchronize. Clicking on the URI will take you to the execution history and specific errors. This should aid in troubleshooting some of these failures. Back in July 2017 when we announced the public availability, the Data Integration feature was supported in North America and Europe. We have since added Australia and Canada. Based on customer demand we will continue to add support for more regions. We are targeting Southeast Asia before the end of the year. Please review the detailed documentation by the Application team here. We are excited to provide insights into new features that we will be announcing soon. We understand that while you want to actively monitor the health of all your projects, and that you also need to be on the move. To this end, we will add the ability to configure email-based alerts. On the Scheduling tab, you will be able to select email-based notifications, which would alert you on jobs that either completed with warnings or failed due to errors. This feature gives you the ability to view history and re-run executions for jobs that failed, either due to issue in source or target data. Once you fix the issue, you will be able to selectively re-run the execution. Note, this feature requires Dynamics 365 for Finance and Operations, Enterprise Edition Platform update 12. 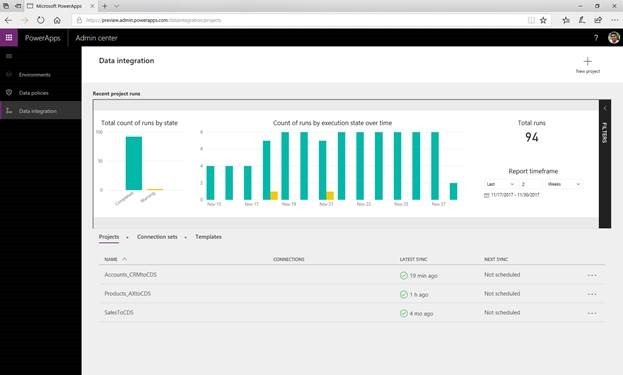 Integration with the Common Data Service will be provided to support scenarios where project management and resource management activities are done outside of Dynamics 365 for Finance and Operations, Enterprise edition and the project accounting activities are done in Dynamics 365 for Finance and Operations, Enterprise edition. For more information, review the roadmap here.